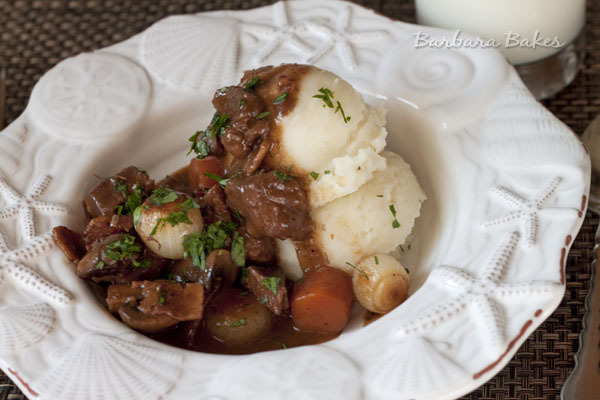 A classic French beef stew with layer after layer of rich delicious flavors. Chunks of beef with smokey bacon, simmered in a burgundy sauce until it’s fork tender; it’s comfort food at it’s best. 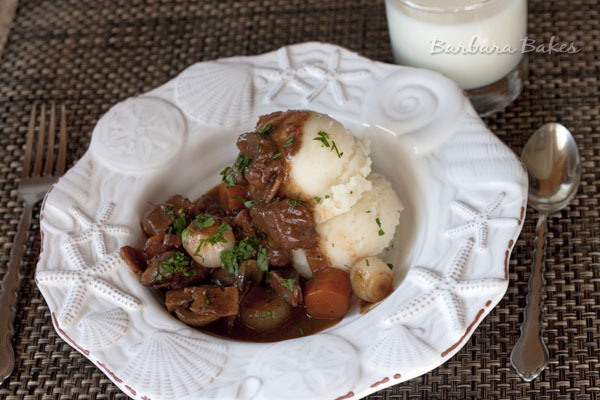 My choice, is the classic Boeuf Bourguignon, it is probably one of the most famous French Cuisine dishes. And among all the possible versions of it, the one I have chosen is Julia Child’s recipe, from her book “Mastering the Art of French Cooking”. Please pardon me if I say this book is almost a bible. Every time I read it to pick a recipe and follow her directions I feel myself full of respect and devotion for this incredible woman. 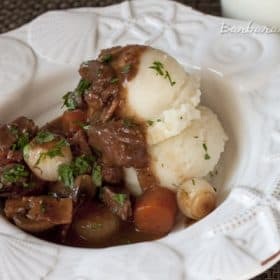 Boeuf Bourguignon (Beef Bourguignon in English) was born in Bourgogne (Burgundy), where beef and wine are its most important products. It’s a traditional Sunday’s dish, to share with the family. This recipe is time intensive, but so worth the effort. My family loved it and were happy to eat it two nights in a row. One night with mashed potatoes and the next over noodles. It’s a recipe I’ve been wanting to make since I saw the movie Julie and Julia. My husband gave me Mastering the Art of French Cooking for Christmas and I’ve had this recipe bookmarked to make since then. I’m so glad Fabi picked it and gave me that little extra push to finally make it. Visit the Daring Kitchen for information on joining the Daring Cooks and to see all the delicious stews the Daring Cooks cooked up this month. Thanks Fabi for a terrific challenge. I’m looking forward to making more fantastic recipes from Mastering the Art of French Cooking. If you want more Julia recipes too, see the info about the JC100 below the bourguignon recipe. In a large oven safe casserole or frying pan, sauté the bacon until it’s lightly brown. Remove to a large bowl with a slotted spoon. Preheat oven to 450º. In the same casserole/pan, sauté the beef until it’s golden brown. (Brown the beef in batches so it browns and doesn’t steam.) Remove it to the bowl with the bacon and set aside. In the same casserole/pan, sauté the carrot and the onion. Return the bacon and the beef to the casserole. Sprinkle it with salt and pepper, then add the flour and toss. Remove the casserole/dish from the oven. Stir in the wine, stock, tomato paste, mashed garlic cloves, thyme, and bay leaf. Bring it to simmering point on the stove. Now, if you were using a frying pan, put the stew in an oven safe dish. While the stew is cooking, prepare onions and mushrooms. 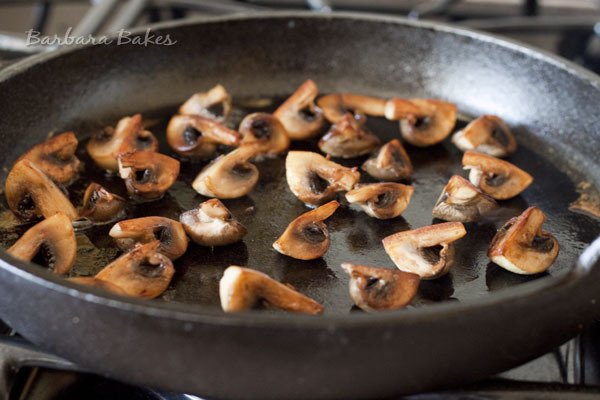 Prepare the mushrooms: Wash quarter and sauté them in 2 tablespoons butter. Keep on stirring until they’re nicely brown. Set aside. For the onions: Melt 1 tablespoon butter in a frying pan and sauté the peeled onions until golden brown. Add beef stock until they’re almost covered and simmer for 20-25 minutes, or until almost all the liquid disappears and they’re tender but keep their shape. Set aside. When meat is tender, put the casserole on the stove and add the onions and mushrooms and heat for 2-3 minutes. Serve it in the casserole with some sprigs of fresh parsley. Some goods sides are potatoes, noodles or rice. I had to take a “Don’t Crowd the Mushrooms” picture. It’s one scene from Julie and Julia that’s stuck with me. Culinary icon Julia Child would have turned 100 years old on August 15th of this year. 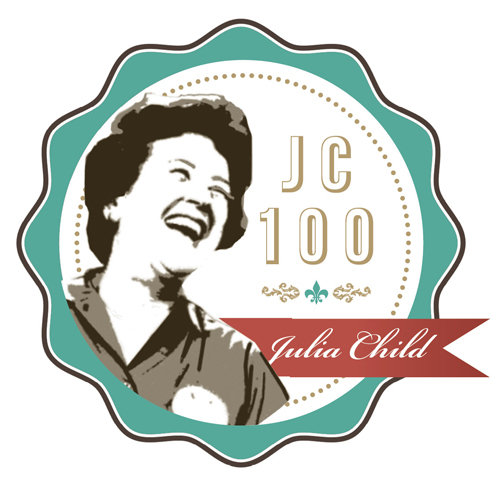 To honor her, a panel of culinary luminaries, including celebrity chef Thomas Keller, former restaurant critic of The New York Times Ruth Reichl, and food writer Amanda Hesser, has selected their most beloved 100 Julia Child recipes. Each Monday, in the 100 days leading up to Julia’s birthday (starting May 7th), bloggers will pay tribute to Julia by cooking and blogging about her great recipes. The goal is to raise one million voices in tribute to Julia. I am a armature cook that can cook master meals I have made this on several occasions and every time i catch people licking out the dish. In step number 5 of the recipe, it says to put in the middle of the oven for 4 minutes to create a “lovely crust”. What temperature for the oven?? Hi Patricia 450 degrees. Great question. I’ll fix that in the recipe. Thanks! I just bought a copy of Mastering the Art of French Cooking this weekend at a garage sale and I spent quite a bit of time just reading through it. I decided I definitely wanted to try this….loved the movie and the part where she made this. So funny you just posted this…timely:-). YOurs looks wonderful – love to see that deep dark sauce. I have wanted to make this for so long! So wonderful that you got to enjoy it! LOVELY! This is my favorite recipe for BB (easier than typing it), hands down. Yours look even better than it looks & sounds in the book AND movie. I love that you served it with mashed potatoes to soak up all that lovely saucy, gravy! I haven’t made Julia’s beef bourguignon, but I have tried Martha’s and it was wonderful, next up: Julia’s! Ever since I saw this in Julie and Julia I’ve wanted to make it! Oh how I’ve always wanted to make this dish. Seeing yours reminds me of that scene from the movie Julie and Julia, only yours came out much much better. Stunning dish! I’m part of the JC100 and I guess we will be making this dish soon. Wonderful job! Your BB looks amazing and delicious! We ate ours with noodles, but I would like to try it with mashed potatoes, too! This may be labor and time intensive but the flavors must be amazing! I love how you plated it. This is such a wonderful recipe. I think this is at the top of my all time favorite meals list. Thanks for reminding me how good this is. I made it this year for New Years Day. I had all the kids and grand kids out. It was a hit! It worked out well because I had the week between Christmas and New Years off, so I had lots of time to cook.